When was the last time you got a good look at a Neandertal’s skull? Well check out the Georgia State University Library’s Exhibit on “Darwin’s Impact.” This display is part of the university’s commemoration of the 200th anniversary of Charles Darwin’s birth and the 150th anniversary of the first publication of On The Origin of Species. Placed in our display case on Library North 1, across from Saxbys Coffee, this exhibit highlights works in the library’s collection that show the expanse of work Darwin has inspired: from the obvious disciplines of anthropology and biology to art, psychology, literature and philosophy. This exhibit has three distinct components: the books in our collection, an online Darwin research site and a display of five molds of fossil skulls, tracing the evolutionary process of human origins. Firstly, the exhibit draws attention to 14 books in our vast collection of Darwin related material, pulled by our subject librarians in the fields of art, anthropology, history and biology. We have listed the book titles together with their location in the building, along with their call number. 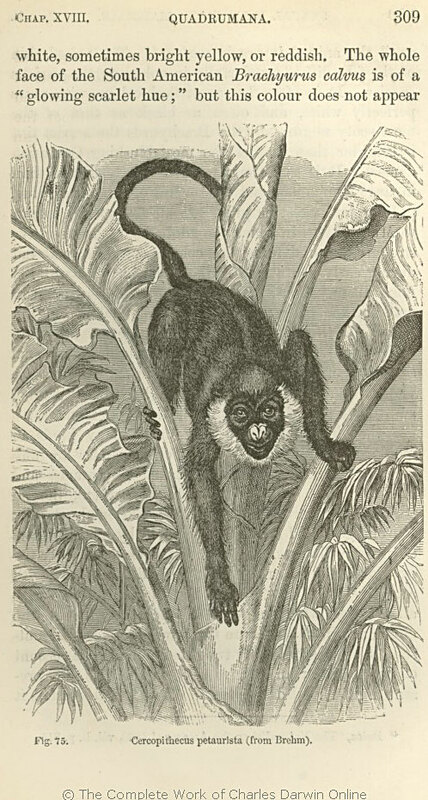 We also paired each title with a unique illustration from one of the publications of Darwin’s original works. These amazing illustrations were reproduced with permission from John van Wyhe editor of The Complete Work of Charles Darwin Online. His site is another fantastic resource for researching Darwin and his impact. In fact, it was such a great source that we included it in our own research guide to Charles Darwin and On The Origin of Species. The online guide includes even more Darwin related resources in our collection, a video interview with Dr. Sean Carroll and a calendar of Darwin related events both on campus and across the world. Dr. Carroll (a professor of Molecular Biology & Genetics at the University of Wisconsin) gave a Darwin related lecture on campus earlier this semester, so if you were unable to attend that event, this is an excellent way to hear about how molecular biology provides profound evidence in support of Darwin’s evolutionary theory. As with all of our research guides, there is a convenient chat window embedded on the page, in case you need to contact a librarian with any questions. Finally, Dr. Frank L’Engle Williams, Professor of Anthropology at Georgia State University was kind enough to loan us a set of five fossil skull molds. Each of these stunning molds demonstrates a different stage of evolutionary development and Dr. Williams provided us with a short description of each of their significance. So if you are interested in researching Darwin further for one of your projects, or even if you just want to look at some cool skulls, please stop by the exhibit and participate in our celebration of Darwin’s Impact and his anniversary! As always, we welcome your feedback! This entry was posted in Books, For Faculty, For Graduate Students, For Students and tagged anthropology, art, Biology, Charles Darwin, Darwin, Exhibits and Displays, fossils, Frank L’Engle Williams, Learning Technologies, literature, On The Origin of Species, philosophy, Psychology, research, Sean Carroll, skulls. Bookmark the permalink. Pingback: National Book Award Winners – Check one out!